Chatbots are the future! Every business and marketer is going to have a bot on their website turning lead conversations into conversions :) You can qualify your site visitors, turn them into leads, help them with questions, book meetings and close the deal - ALL OVER THE BOT! Tars is the pioneer in chatbot marketing driving change from forms to conversations. We have over 9000+ marketers who have created more than 15000 bots using Tars platform. Conversion rates are up by 25-30%. As a Tars partner, you are going to give your audience the cutting edge marketing tool that helps them drive more conversions and ultimately more REVENUE!!! What will be the sales process? How does it work? Once you join us as an affiliate, you will get a unique referral link. Send leads to Tars using that unique referral link. We will keep the cookie for 60 days & if the lead signs up within 60 days of referral, it will get logged under you and you will get commission cut for whatever this lead pays Tars from there on in subscription fees. Tars Team will take care of the deal closing and will make sure that referred user stays with us for longest possible period. 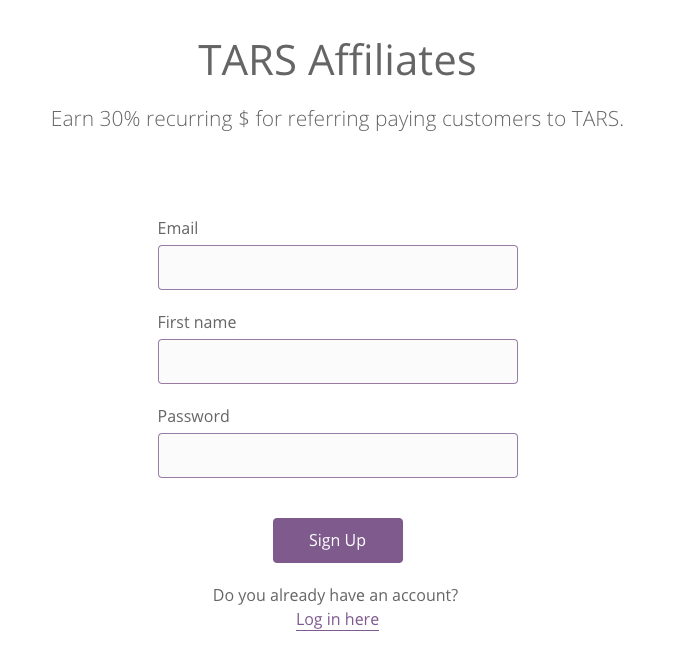 So, you just have to refer users to Tars & we will take care of the rest. Payments will be approved on weekly basis. 3. As soon as your affiliate request is approved, you will receive a welcome email(on the email you registered with) with the affiliate/referral link. 5. Your affiliate link will automatically be added on the "Powered by Tars" branding on all your bots. This means that your own bots can now help you make money through referrals who end us becoming Tars customers. 6. From now onwards, you will make a recurring revenue from every user who uses your referral link to sign up for Tars and eventually subscribes to any of the paid plans. What help & support will I get from Tars team? We consider our affiliates as our own team members. So, you will have direct access to our team members to discuss ideas and get answers to your queries. Apart from this, you will also get early access to all the new features & products that we ship. 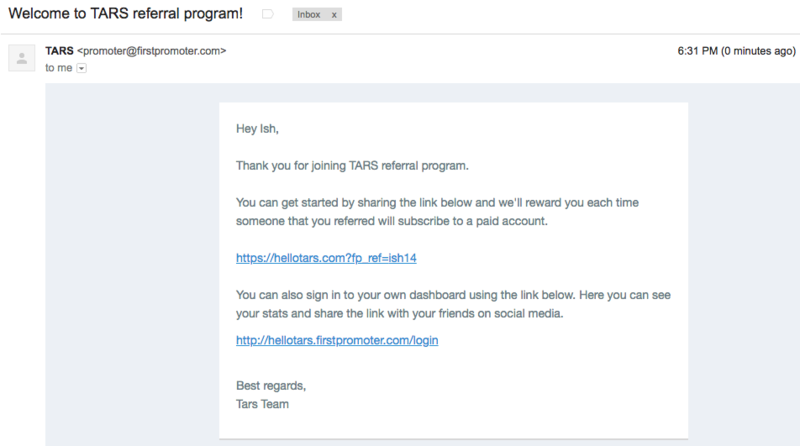 How much will I earn as a Tars Affiliate Partner? Our pricing is pretty straight forward – an average user pays us ~$100/month. And, our commission structure is transparent – 30% cut & recurring. So, if you refer 20 users, you will earn $660 every month till these users are using Tars. In a nutshell, your earning potential is unlimited. So, what are you waiting for? Come join our team as an Affiliate Partner today.